First Congregational Church is holding its fifth annual “Service of Blessings for Animals” on August 19 at Wynkoop’s airport. The service starts at 10:30 AM and is followed by a potluck lunch. The church holds its annual animal blessing services to celebrate creation and animals in particular. The public is invited to bring a furry, feathery or scaly friend, helpmate or livestock – or a photograph of one– to be honored and blessed. Rev. Scott Elliott, pastor at First Congregational noted that “This wonderful service is for the community so members, friends and new comers, with or without a pet or livestock, are invited. It’s really a fun and uplifting service with touching stories about the gathered animals. In the past we have blessed a variety of God’s lovely critters including cats, dogs, hermit crabs, goldfish, ferrets, chickens and goats. 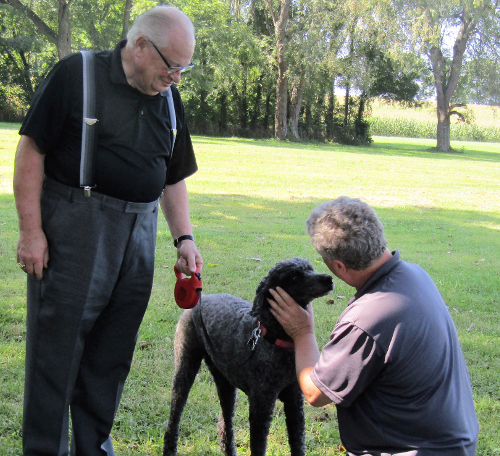 I look forward to this service and the potluck afterwards all year long.” Elliott added that the outdoor service traditionally has hymns, prayers, liturgy, a short homily, and introductions and blessings for the animals. Any pet or farm animal under control of an adult is welcome. Attendees can also bring a picture of an animal to be blessed at this special service. Wyncoop airport is located at 9051 Granville Rd. For more information call First Congregational Church at 740-393-1736 or go to the church website at mvucc.org.